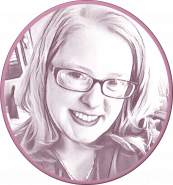 We Christians earnestly want to be more “Christian” but do we want to be more “Christ-like”? Well, Christ “liked” something very specific. He had a singular purpose on earth and that purpose was clearly stated in John 17:24-26. He wanted to do His Father’s will so that He could bring glory to Him and He did. Jesus even went as far as to say that He couldn’t do anything outside of His Father’s will or “desire.” We know that was because He was God Himself. God’s “desire” is always defined as Him having full thought, full knowledge, full power, and absolute intention. Paul tells us…. How can these both be true? How can God on one hand express a sincere desire for all people to be saved and then actively prevent it by hardening their hearts so that they can’t be saved? I don’t wish to lead you to believe that I have had even the slightest amount of sanctification enough to have wrestled this bear to the ground myself. I would point you back to these men and what they have to say about God having an expressed-will and a higher-will. John Piper – Are There Two Wills in God? A good example of this conflict of wills is a parent’s sincere desire that his or her children have peace and blessing while, at the same time, being willing to forgo a child’s peace and blessing by inflicting quite the opposite; sometimes painful discipline. Why? Isn’t that two-faced and disingenuous? No! A parent, like God, knows that while happiness is good, holiness is hard-fought. There was a lot of despair and pain on that cross for His Son, but it led to God’s ultimate goal of redeeming a people for Himself and His glory. One desire constrained another desire simply because one was more important than the other. Saving souls is desired by God but bringing glory to Himself is desired far more. In John 17:24 Jesus tells God that He sincerely wants us to be with Him in heaven, but again, it’s all about glory. Who can keep God from getting what He wants? What is God’s greater desire? The greater desire that rules all other expressed desires of God for His children…is the desire for His own glory. God is a jealous God, a selfish God in every way divinely imaginable. So consumed and passionate is He with His own glory that He kills His Son to accomplish the glory of redeeming a people for Himself. We are meant to become more like Christ. Jesus spent His whole life seeking to do the Father’s will in order to bring glory to Him. That was Christ’s highest aspiration. It will become our highest aspiration as we move through this life becoming more and more sanctified. If you don’t feel that, then maybe some other ‘thing’ is in the way. We have to constrain that ‘thing/idol’ that we desire over the glory of God and we can only do that with the help of the Holy Spirit. 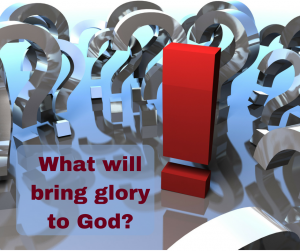 With every small and large decision that we make we should be asking the question, “What will bring glory to God?” That truly is the only question that matters. Asking God anything should have a root purpose and that is HIS GLORY; not satisfying ourselves while here on earth. Pastor Wilson just preached a powerful sermon on Suicide last week in light of the recent celebrity suicides and the fact that we were studying the book of John where Judas killed himself. Christians can fall into deep despair for a time just like any other person. They may even face the very large decision as to whether or not they will take their own life. Oh, I pray that they will receive a spiritual helping hand that poses the question to them, “Will murdering the image-of-God (you) bring glory to God?” If they are of sound mind and a believer then they will surely answer, “No.” If they can, but for a moment, remember that their weakness and despair is exactly the place where God can show His strength and be magnificently glorified then perhaps their minds can refocus on what God desires and not what they desire so earnestly in that moment. …”whom you have given me…” This only refers to those that will be saved.